I hope this is worth 30 seconds of your precious time. 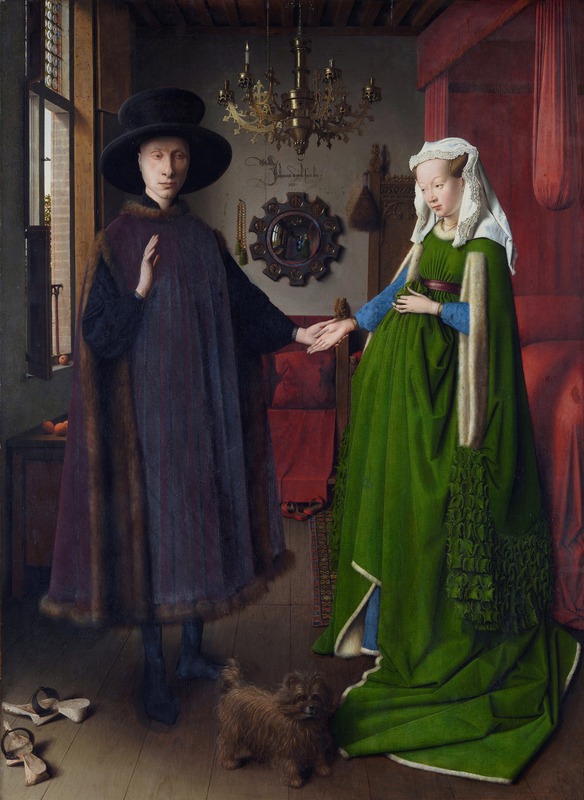 Ladies and gentleman, the Arnolfini Portrait by Jan van Eyck, 1434, in the National Gallery, London. It will be too small on your screen; you will need to click on it to see the carvings on the bedposts. The faces had me pretty much hooked, but then I looked in the mirror behind them, and it was like in a film when suddenly the focus of the image deepens and there is too much horizon. And then there is the green of her dress, its tumbled folds, the hat that seems about to swallow his head. You can also see the painter within the mirror (the mysterious figure in blue if I’m not mistaken). There is a Richard Powers novel that references this painting (I believe Galatea 2.2, but I may be wrong); also Gaddis’s The Recognitions is chock-full with these pre-Renaissance Flemish painters (I believe van Eyck being one which the main character Wyatt forges). I agree, a fascinating painting.